"This institution will be based on the illimitable freedom of the human mind. For here we are not afraid to follow truth wherever it may lead, nor to tolerate any error so long as reason is left free to combat it." 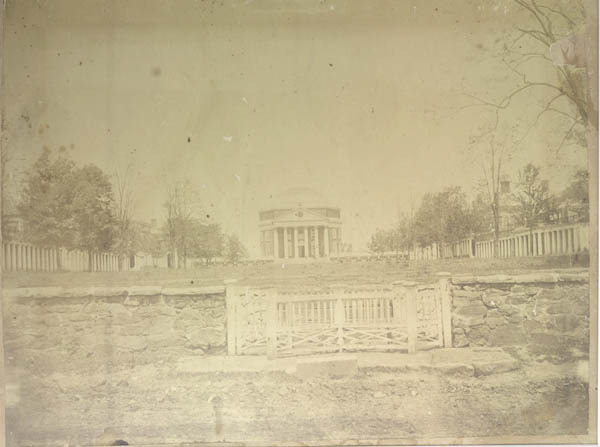 This photograph shows a view of the Lawn just after the Civil War. At the time, the Lawn ended at this "cow-catch" that prevented livestock from grazing on the Lawn--unless a groundskeeper decided that it needed trimming. 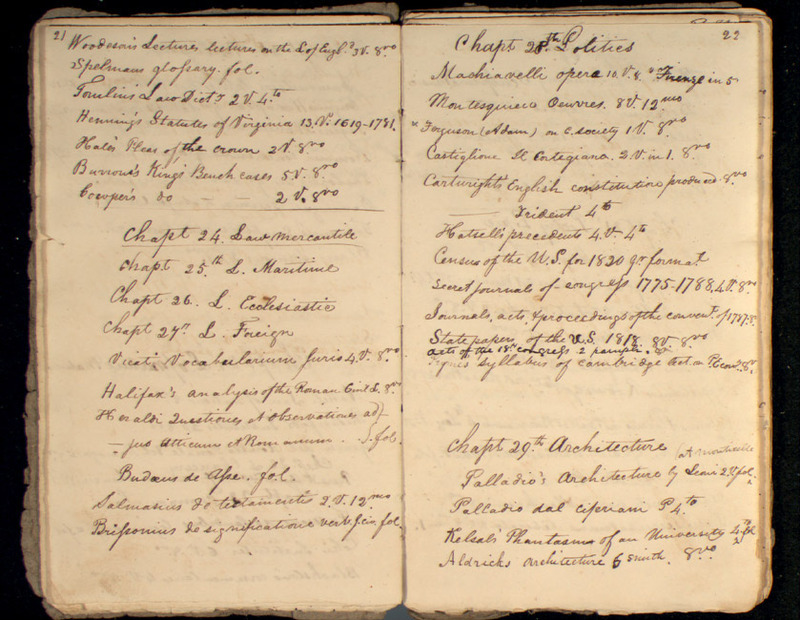 University of Virginia Library catalog, 16 May 1825. 62 pages. John V. Kean, a Louisa County schoolmaster, was the first person chosen as Librarian of the University Library. He was recommended to Jefferson by his father, Andrew Kean, a prominent central Virginia physician who himself had been offered and refused the University's first professorship in medicine. Kean pointed out that his son possessed a "good English education, a tolerable acquaintance with the Latin tongue, and some small knowledge of the Greek." He lasted nine months as librarian for a total salary of $150.00. Almost his only duty in a University that had few books and fewer students was to compile a catalog. 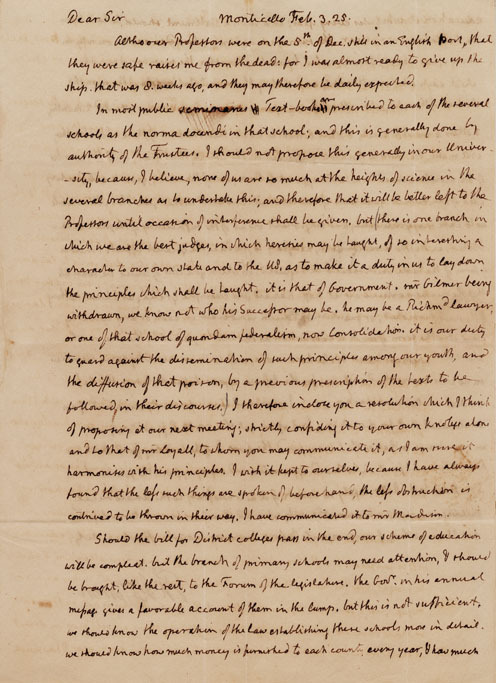 Jefferson was particularly concerned with the books on government and warned Joseph C. Cabell in a letter on February 3, 1825, to select texts carefully and avoid those with Federalist propaganda. 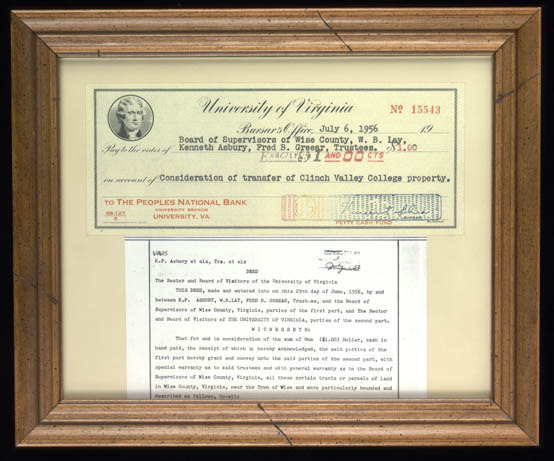 This check for $1.00 was issued by the University of Virginia in 1956 to the Board of Supervisors of Wise County to purchase the land on which the University of Virginia's College at Wise, formerly Clinch Valley College, now stands.